Rise & Shine Interview: Jen Saunders | Arianna Merritt, M.Ed. I'm excited that today, Jen Saunders, is “Speaking From the Heart” and sharing her experiences with all of us. The "Speaking From the Heart" interview series is a weekly feature. Every Thursday, inspiring writers who have empowered me speak from their heart and act as role models for other aspiring writers on their journeys. Let the words of these writers guide your path. I encourage you to listen to their stories and apply the lessons in your life. Jen Saunders is the creator of Wild Sister Magazine and the Wild Sisterhood . 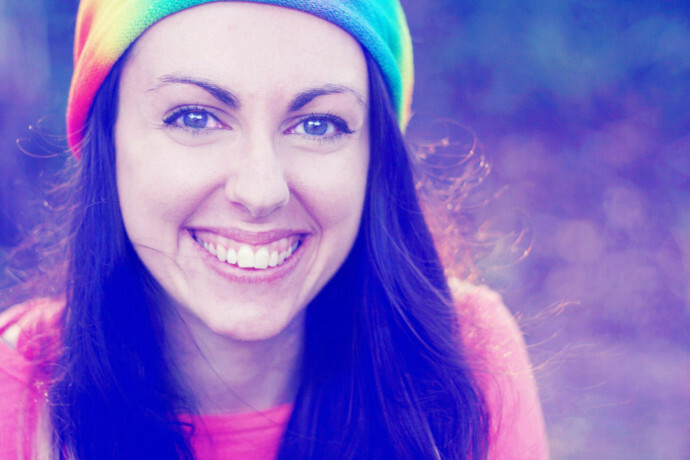 She’s a tie-dye wearing daydream believer, writer and spirit junkie. Jen's got so much love for women who own their power, smile at themselves and believe that happiness is a choice – so if that's you, give her a wave at any one of her online homes (Facebook, Twitter) so you can connect! I am really inspired by Jen's vision and the Wild Sister Community so I asked her to be part of this series as she is a mentor to me. Read her interview below. When it comes down to it, it’s all about being yourself. If you don’t speak from the heart or express who you are, then you’re cutting yourself short. Everyone deserves to live vibrantly as who they really are, and that’s where true happiness and freedom flourishes. Writing has been a life saver for me. Ever since I started writing a few years ago, it has allowed me to let things go, heal, and gain a much clearer understanding of who I am and how I want to live my life. Not only has it helped me overcome personal hurts, it has become my passion and my work, allowing me to do what I love and earn a living from it. Before I started writing, I didn’t really know who I was. I knew I often had deep and powerful ideas and thoughts swirling around in my mind, but I didn’t know how to express them. I found that the only way I can clearly and easily express these deepest, most vulnerable parts of myself is through writing. Writing is my authentic voice. When I first started, I didn’t think many people would read it so even though I was nervous about hitting publish on my first blog post, I wasn’t too worried. I didn’t set out to be the most articulate writer or a literary genius, I just wanted to share my unique perspective of the world and hope that maybe it would help someone. The courage to stand tall took time, and is still building every day. I find that the more I do what scares me, the easier it becomes. After all, that’s what courage is; doing something even though it scares you. Usually, if I’m having a hard time writing something, I don’t write it. The best things I’ve ever written have come in a swirl of inspiration, and I write it down, either on my laptop or on my phone if I’m out. I created it! I felt like I’d been searching for ‘my people’ for so long, and I started to feel like I found connection with the readers of Wild Sister Magazine, so I created an online community called the Wild Sisterhood. Now, I really feel like I belong somewhere, and I’m so happy to be surrounded by such inspiring, strong, passionate women – true Wild Sisters! Don’t be afraid of the blank page. Just write. And don’t second-guess yourself, if it feels right to you, then do it. If it comes from the heart, it’s never wrong. Thanks for speaking from your heart and empowering others, Jen! Keep up the fantastic work! Nov 25 Are You Addicted To Sugar?